The genus Ficus includes hundreds of species of trees, shrubs, and vines that can be found around the world, mostly in tropical and subtropical regions. Some species are lithophytes (plants that grow on rocks). Many are epiphytes (plants that grow on other plants), and in fact about half of all ficus species start out that way. These strangler figs germinate in treetops and develop serpentine aerial roots that completely engulf their host. Many animals, including apes, elephants, rhinos, tapirs, and giraffes, enjoy ficus browse. In fact, the Zoo's many species of ficus provide 2.5 tons (2.3 tonnes) of animal browse each month. And that's just small potatoes, compared to the natural world. Throughout the Earth's tropics, ficus provide food and habitat for a rich variety of animals. Tree-dwellers like monkeys, birds, and fruit bats enjoy the sweet fruit and disperse the seeds high in the branches of trees. When you bite into a juicy fig, you're actually eating flowers. That "fruit" is really a hollow, fat stem tip with flowers on the inside. You might wonder how flowers enclosed in a fig get pollinated. Tiny wasps hold the key. Female wasps lay their eggs in figs, so newly hatched wasps begin their lives inside a fig. A male lives his entire life inside the same fig, and he has just one job: to mate with females before they exit. Female wasps grow wings and eventually leave their birth fig—carrying with them a bit of its pollen. Then they look for another fig. The tiny female wasp wriggles into a narrow opening at one end of her chosen fig. Safely inside, she lays her eggs—and spreads pollen from the fig she hatched in, thus helping the fig produce viable seeds. The cycle of the female wasp is complete, and she dies. Her eggs hatch, and the young wasps grow, repeating the cycle. 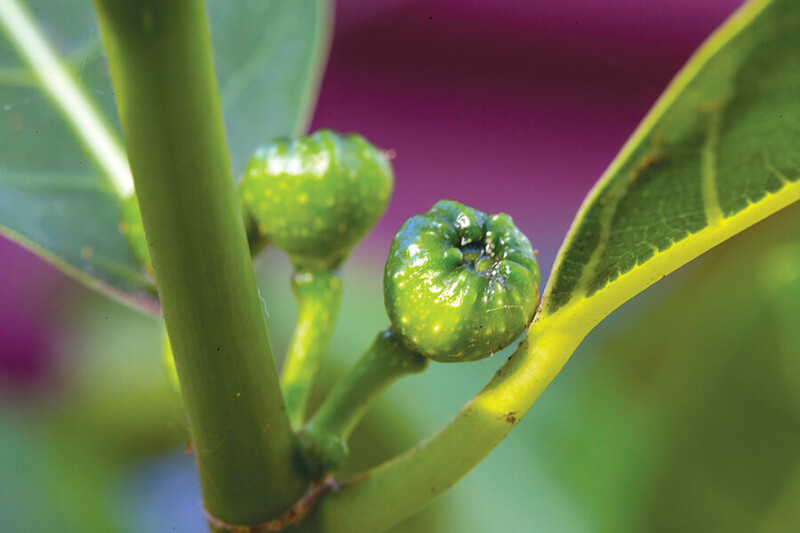 Each ficus species is pollinated by its own species of wasp. "Browse" refers to leafy branches that are food for certain animal. Ficus—along with eucalyptus, bamboo, and acacia—is an especially important source of browse for the animals at the San Diego Zoo. A dedicated, knowledgeable, and hard-working crew of horticulturists harvests the browse for our diverse animal collection. The Browse Department supplies the foliage that feeds many Zoo and the Safari Park species, including giraffes, koalas, giant pandas, elephants, and many primates. Our keepers enjoy the luxury of selecting browse from a barrel full of verdant, freshly cut vegetation delivered right to their area’s door, and the positive impact on our cherished animal collection is huge. The San Diego Zoo maintains one of the largest ficus collections in the world. This nationally accredited collection includes more than 120 species and some of the Zoo's oldest and largest trees. You can explore our ficus plants by taking a self-guided tour through Discovery Outpost and Front Street. Look for ficus trees to play a starring role in the Zoo's newest exhibit, Conrad Prebys Africa Rocks, when it opens in summer 2017. This unusual ficus is a rheophyte: a plant that grows in fast-moving water. It grows along creeks and riverbanks in New Guinea and Australia, where it survives yearly floods and strong currents. Not long ago, variegated plants such as this one were fairly uncommon. Now, with interest and varieties at an all-time high, gardeners and plant lovers can enjoy a whole spectrum of patterns and mosaic designs. In India and Pakistan, banyan trees grow to colossal sizes and are considered sacred. Despite the tree's enormous full-grown size, it starts out as an epiphyte, growing in a treetop with air and light and rain for food, and then sends its roots down the tree's trunk to become a tree on its own. Although this evergreen tree is known as a weeping Chinese banyan, it actually hails from India and Southeast Asia. It's a popular and easy-to-care-for houseplant, so it comes as a surprise to many people that the tree also grows well outdoors and can reach heights of up to 30 feet (9 meters). You might find this fig overhanging a stream in Central Africa. The species grows in tropical forests, as a small tree, a shrub, or a vine-like epiphyte. From the highlands of New Guinea, this spectacular tree produces giant leaves and softball-sized figs reminiscent of breadfruit. The tree is hard to propagate, so it is uncommon in cultivation. 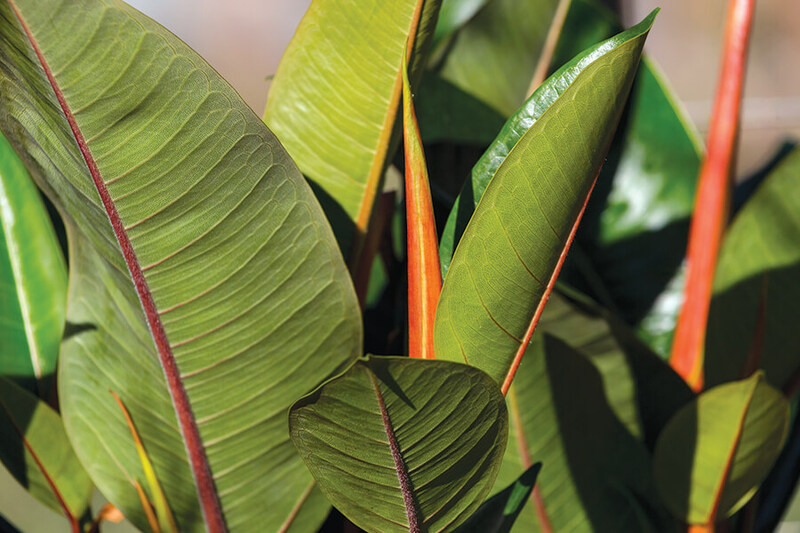 Rubber trees, native to Tropical Asia, have been widely used as indoor plants for 100 years. The figs are small and insignificant, but the leaves can be 12 inches (30 centimeters) long and 5 inches (13 centimeters) wide. The bark of the rubber tree produces copious amounts of white latex sap, giving rise to its common name. Until the late 19th century, it was an important source of rubber. This small tree grows near creeks and in rain forest scrublands in Vanuata, New Caledonia, and Australia. The leaves can take on many forms; sometimes they have lobed indentations on the margins. Found among woodlands and rocky outcrops across much of Africa, this plant is mostly absent from the tropical rain forests and arid regions within its range. The leaves from this tree have been used to treat many ailments for over 2,000 years. A sprawling rock fig from Africa, this tree grows on rocks or cliff faces in drier regions, becoming a forest tree in higher-rainfall areas. It goes through a brief deciduous period, followed by a flush of bright-red foliage. One of the African strangler figs, the Zulu fig can also be cultivated as a tree. New growth is lighter than the older leaves. Aerial roots that resemble pillars support the massive limbs of the Moreton Bay fig. With all its spreading limbs and support roots, a single tree can cover a whole acre in its native Australian habitat. One of our trees has a trunk circumference of more than 38 feet (11.5 meters)! This ficus can grow as a shrub, a tree, or a small rock fig, depending on habitat. It's nearly always associated with rocks in the arid regions of Madagascar. This large fig tree at the edge of the Safari Park's Mombasa Lagoon in Nairobi Village provides shade with its thick, glossy leaves. In India and Southeast Asia, the twisting trunks and aerial roots of fig trees are thought to be the homes of spirits, and people sometimes leave offerings nearby. From Mysore, India, this large tree is a rapid grower if it gets enough water and room to develop. The crisp leaves are 6 inches (15 centimeters) wide by 10 inches (25 centimeters) long and have a small "drip tip" at the end. The figs are densely covered with rust-colored fuzz that fades as a fig matures to reddish purple. This species is used as browse for Zoo primates whenever it is available; its fruits are offered to hatchlings in our Avian Propagation Center. Found throughout the islands of southern Asia and in eastern Australia, this small, resilient plant grows in many environments and even survives occasional wildfires. Its common name comes from the sweet figs it produces and the sandpaper-like texture of its leaves. This species from the Pacific coast of Mexico is one of the most spectacular and odd-looking fig trees on Earth. It is almost always found growing on boulders, with roots that look like flowing lava as they hug the rocks. The largest tree in Sun Bear Forest, a 40-foot-tall (12-meter) radulina towers over the lion-tailed macaques from the center of their enclosure, providing important shade and climbing opportunities for the primates that share the enclosure. This irreplaceable, lanky fig, the only one of its kind in the Zoo, is only half its ultimate size. This fig species from India is reputed to be the one beneath which Buddha attained enlightenment. The sacred tree, with its smooth, rust-colored bark, is deciduous in San Diego. The figs are less than an inch in diameter and turn dark purple as they mature. The medium-sized leaf, 5 inches (13 centimeters) wide by 6 inches (15 centimeters) long, is heart-shaped with a wide base and a long drip tip. When available, Bo tree branches are popular browse for primates at the San Diego Zoo. This tree, native to eastern Africa, produces large figs that grow on the trunk and branches. Discovered on the islands of Socotra, off the coast of Yemen, this spectacular tree is native to many parts of the Horn or Africa as well. It requires very little care and minimal water, making it a good tree for San Diego. Not all fig trees are big. In fact, many types grow as vines, shrubs, or small plants. This sprawling, vine-like species comes from southern Taiwan, where it grows among boulders near the coastline. This large tree grows in moist, upland regions from Mexico to Brazil. In its native environment, orchids, mosses, and other epiphytic plants cover its branches, creating an entire ecosystem. From southern Asia through northern Australia, this medium-sized tree is used by humans and animals. Metallic starlings feast on its bright-orange figs, and people have used its sap to protect against insect bites. The San Diego Zoo's largest specimen of this Australian native is our "Big Fig," a 440,000-pound (200,000-kilogram) specimen that was relocated as the centerpiece of the Monkey Trails habitat. The canopy continues to produce new growth, and the soil is full of new roots. It produces seedlings too, so we know that there must be a pollinator wasp at work. We have relocated a number of the seedlings to our nursery to plant in other areas. Judging by the huge strangler figs that writhe over and through the ruins of many ancient cities, it's likely that they are mainly responsible for the destruction of bygone Mayan pyramids and other majestic structures in Mexico and Central America, as well as early European forts built in the Caribbean. In the Safari Park's African Plains exhibit, surrounded by rocks and boulders to protect their delicate root systems from heavy animals and pounding hooves, some of these adaptable trees provide shade. Many ficus species are used around the world as ornamental garden plants, and some make excellent houseplants. The IUCN has assessed 51 species of ficus, and has categorized 24 of these as Vulnerable or Endangered—with 2 that are Critically Endangered. 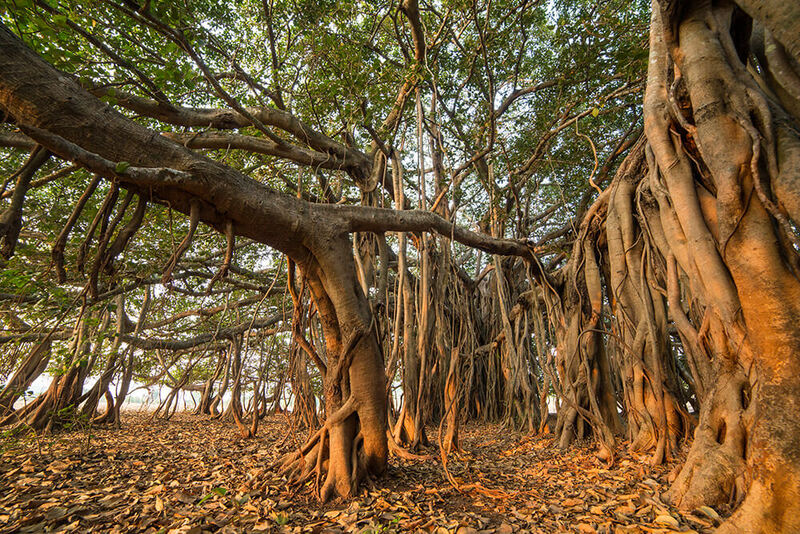 One banyan tree in Calcutta, India covers nearly 4 acres (1.6 hectares), with 1,500 aerial roots forming that reach the ground and function as extra trunks.